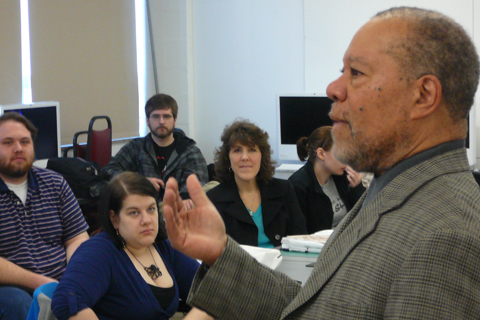 In 1992, nearly 20 years ago, Prof. Elaine Cunfer and I went to Philadelphia to hear Jerry Pinkney speak. Mr. Pinkney was being given a lifetime achievement award by Drexel University. If he had been struck by lightning, or hit by a bus that day in Philadelphia his place in the pantheon of great children’s book illustrators would have been secure. 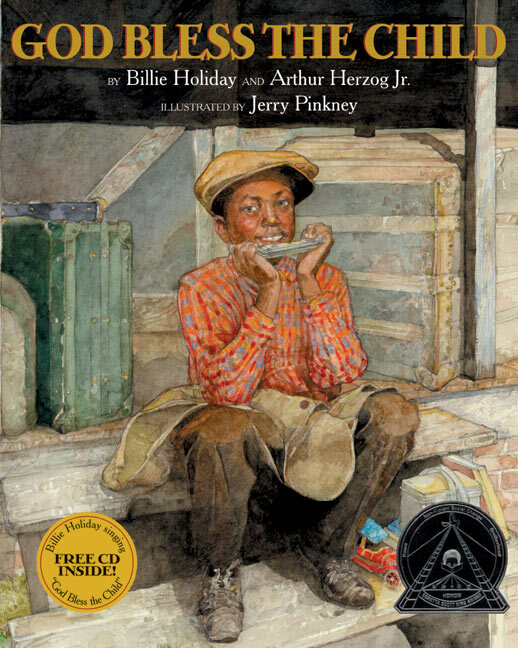 He hasn’t rested on his laurels in the past 20 years he has amassed many more awards, including a silver and gold medals from the Society of Illustrators, multiple Coretta Scott King awards, five Caldecott honors, and the ultimate prize in children’s book illustration, The Caldecott Medal in 2010. 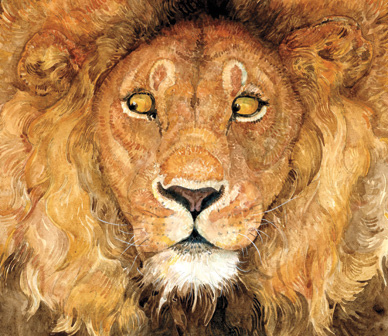 That Caldecott was for The Lion and the Mouse, his wordless retelling in watercolor of the classic Aesop’s fable set in Africa. He has had three major museum shows at the last year including one in Lancaster at the PA College of Art and Design. He had a show at the Schomberg in NYC and a major retrospective at the Norman Rockwell Museum in Massachusetts. There is no doubt Jerry Pinkney’s artwork is suitable for framing. We even exhibited his artwork at Sharadin Gallery during the Dornish Collection exhibition. Some curators don’t believe illustration belongs in gallery. In some cases this is an old elitist fine artist aesthetic bias. A reasonable argument can be made, though, that his artwork is best seen in print, in a book, in the context of illustration. Not to diminish the achievement of his museum shows, but watch someone in a gallery the stop and look at a picture. Count, one, two, three, I find most people look at an individual picture for about 5 seconds max. 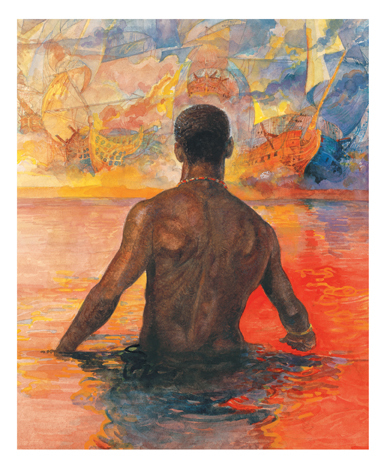 Jerry Pinkney is a master of line, color, and composition. His work rewards those who take the time to look at it longer that 5 seconds. Now try this. Read one of his books to a youngster, someone 5 years old, in his target audience. Children’s eyes will linger over every page far longer than the gallery-goers eyes might. When you try to turn the page, the child might turn it back to look at it longer. Children know greatness when they see it. My favorite anecdote was from earlier in his career. Young Jerry Pinkney, aged 12, had a newstand in the Germantown section of Philly. Between sales he would sketch the view of the shops across the street. One day a cartoonist named John Liney stopped by the newsstand and admired these sketches. He invited the newsboy up to see his studio and gave him a handful of art supplies. John Liney was the man who drew Henry, a comic strip originated by Carl Anderson. 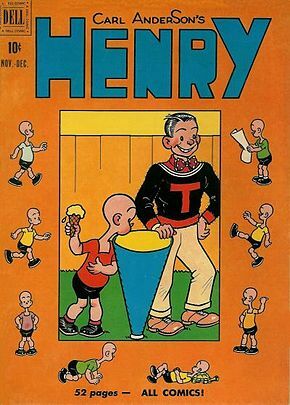 Henry was one of the most popular newspaper comics of the time. Pinkney warmly recalled the studio visit that gave him the ‘first glimmer of an idea’ he might be able to make a living as an artist. John Liney's Henry, illustration from Wikipedia. 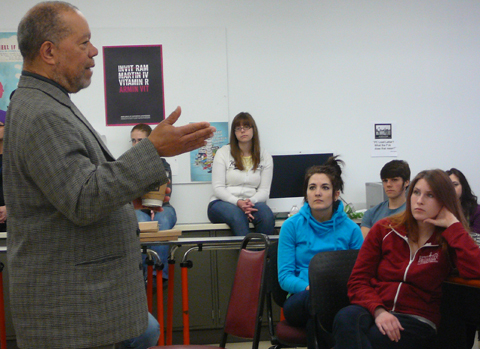 By the way, there is another blog by a KU faculty member, Dr. Marty Rayala of Art Ed & Crafts. It is called andDESIGN. Clearly, Dr. Rayala is much more efficient that I am. His posts about Jerry Pinkney and Beth Krommes have been online for two weeks already. He calls andDESIGN -“the online magazine for people interested in Design Education in K-12 schools.” It is well worth a look.